Once an 18th century outpost for the Dutch East India Company, Compagnes Drift farm in Bot River, is now home to Beaumont Wines, a family-run winery with a proud tradition of making individualistic wines from ancient clay-rich soils in the Walker Bay region. Founded by Raoul and Jayne Beaumont, son Sebastian is the winemaker with daughter Ariane assisting in management. 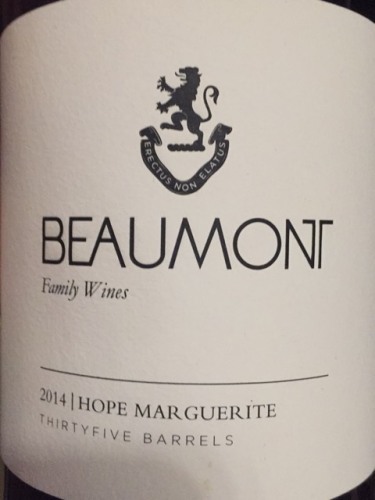 Named after Hope Marguerite Beaumont, a woman with character, elegance and a love for wine. We have produced this Chenin to reflect the pure character of the grape and the individual philosophy of Beaumont wines. 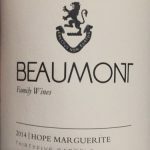 Our very first vintage of the Hope Marguerite was produced in 1997. Only fruit selected from our oldest Chenin Blanc vineyards, planted in 1974 and ‘78, are used for this wine. Barrel fermentation takes place in 400L French oak using only natural yeasts. No malo lactic fermentation takes place in order to retain as much natural freshness. The wine is kept on its gross lees for 10 months with regular batonage, giving it a richer and fuller palate. One of the greatest vintages in the last 5 years. Healthy pure fruit that are full of flavour. A careful selection of the most characterful fruit our oldest vineyard at Beaumont, left to ferment naturally with minimum intervention, matured in mostly old 400L French oak, of which15% was new wood. This wine remained on its gross lees for 10 months in 400L barrels with regular batonage. Fresh, clean and powerful fruit which will develop beautifully over the next 5 – 10 years in bottle.